It was one of those finest days at Bhuvana Vijayam. King Rayalu along with his Ashta Diggajas was enjoying the literary discussion session that day. 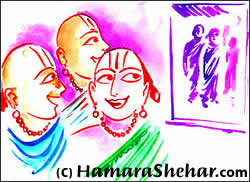 Rama Raja Bhushana was known to be a romantic poet, authoring prose and poetry reciting women and their beauty. Rayalu asked Rama Raja Bhushana to frame a stanza on the beauty of women, extempore. Rayalu was impressed about the way Rama Raja Bhushana described the beauty of woman instantly. Pleased over, Rayalu appreciated him and felicitated him with one thousand gold coins. Hearing this the total gathering immersed in laughter. Rama Raja Bhushana had no way to counter Ramalinga, though he wished to, as the damage was already done. He could only manage sitting calm grinding his teeth on Ramalinga. Some days later, one fine evening Rama Raja Bhushana along with his disciple was passing through the street in which Nandi Thimmana’s residence was located. A subject discussion was going on in Thimmana’s house during that time. Rama Raja Bhushana could locate Ramalinga from distance, participating in the discussions. The sarcastic poetry described that the session was like an assembly of pigs that gathered near the threshold of Nandi Thimmana. This meant that the discussion session would resemble similar to the gathering of pigs, for those who composes prose and poetry with a mixture of nonsense, brutal language, and irrelevant issues. Rama Raja Bhushana taking the meaning immediately rushed off the place along with his disciple. That was how Ramalinga humiliated Rama Raja Bhushana.